In what was a rare treat for a Sunday night. 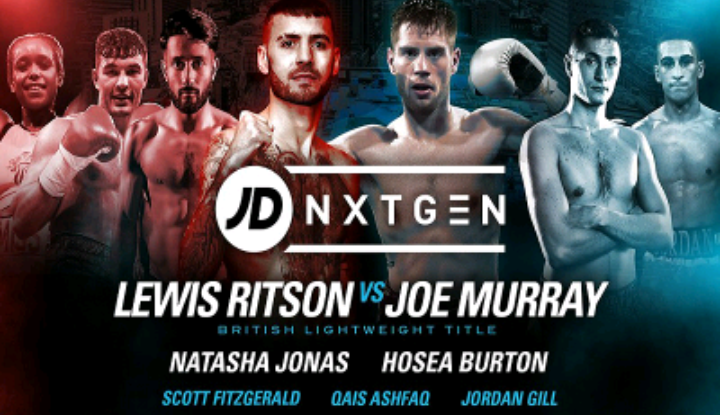 Matchroom brought another edition of its NXTGen card to the Victoria Warehouse in Manchester. For those that are unfamiliar with the concept, NXTGen does exactly what it says on the tin. It is a platform for British boxing’s young stars to achieve some exposure to the public, learning their craft against a great crop of domestic talent. Our night kicked off in the light heavyweight division, with the return of former British Champion, Hosea Burton at the weight. Burton hasn’t faced anyone of note since losing his title to Frank Buglioni in 2016 and stepped up and back down to cruiserweight. His opponent this evening was a very game Josep Perkovic (4-3-1) Burton used his superior height and reach advantage to keep his man at the end of swift right jab, although it has to be said it appears he was putting too much thought into his own work. Allowing his opponent to get his own work off, leaving Burton with a bloody nose. A quick start in the first round gave the impression that an early nights work might be in order, but Burton did not have things his own way. Burton was making it clear he was looking for the big right hand, rather than set his attacks up more behind the jab. This allowed Perkovic to get some nice work off, as Burton’s shots were easy to see coming a mile off. It wasn’t pretty and certainly not his best work. But referee Steve Grey awarded him a decision of 78-75. Burton will have one eye on the British title fight on March 24th between Frank Buglioni and Callum Johnson. If Buglioni wins, a rematch would seem likely. However, if Johnson wins he and Burton are stable mates and a fight between the two will not happen. Forcing Burton to pursue other avenues and other titles. Up next was the debut of Rio Olympian Qias Ashfaq taking part in his first professional bout in the bantamweight division against Brett Fidoe (8-43-4). He picked up a unanimous decision with the referee returning a score of 40-36. At first glance there is a lot to like about him. He has very quick hands and quick feet which enabled him to get out of range of attack but close enough to still land his own shots very well, although it has to be said he did struggle with finding his range early on. I was impressed that he showed no sign of nerves, and I really liked what I saw in terms of his technical ability. He is trained in the gym of Jamie Moore and has a wealth of experience to learn from fighters like Carl Frampton, Tommy Coyle, Rocky Fielding and Jack Catterall. Im sure he is the envy of many a budding pro with a very strong platform and very strong team behind him to push him to the upper echelons of success. What is interesting is that Ashfaq is a long-time adversary of Michael Conlan, the two meeting many times in the amateurs. No doubt a future meeting between the two of them could well be written in the stars. We expect to see Ashfaq again on the undercard of Amir Khan in Manchester on April 21st. In keeping with the Olympian theme, Natasha Jonas kept up her progress in the Super Featherweight rankings, winning her fifth professional fight by unanimous decision against Karina Kopinska (10-23-3). It was very much one way traffic for the whole fight. Referee Steve Grey awarding all six rounds (60-54). Jonas needs to escalate her competition given she is 33. I like the Jonas’ footwork, she over relies on the classic 1-2 but I am particularly impressed with a bolo like uppercut she uses to the solar plexus, but I’d like to see her double up on that. Expect to see her too in Liverpool on April 21st. In what was the fight of the night in my opinion Jordan Gill beat Jason Cunningham in a British Featherweight title eliminator. Winning by a unanimous decision (98-91, 97-92 & 98-90). The first round was very even, but from then on in Gill took full control of the fight. The move of trainer seems to have worked wonders for Gill. I was particularly impressed with his upper body movement, this enabled to him to stay in the pocket but evade Cunnigham’s work and reply in kind. By the fourth round he had really found his range and this allowed him to time Cunnigham, who’s footwork is very poor offensively. A great right hand forced Cunningham to touch down. Cunningham had a solitary good round in the seventh, but this was cancelled out by a great left hook counter to the body which put him down for a second time. From then on in, the better work and cleaner shots were all in favour of Gill, who held centre ring and controlled the pace brilliantly. Gill did have to grit his teeth in the tenth as Cunningham came looking for the knockout and got through which some shots which left Gill hanging on, but he was able to stay the course. For Gill, the win leaves him firmly in with a shot for the British title held by Ryan Walsh. But he may likely have to wait as a rematch between Ryan Walsh (Champion) and Isaac Lowe is expected to happen. So a shot at stable mate and Commonwealth Champion, Reece Belloti may well be next. In the main event British Lightweight Champion Lewis Ritson blew away challenger Joe Murray in a single round. Ritson looked incredibly sharp and it paid of very early in the fight. The champion left Joe Murray writhing in agony with a great hook to the body. From then on it was the champion stalking challenger, a further knockdown put Murray further into deep water. With Murray on the ropes trying desperately to avoid more painful body shots, Ritson switched to punishing the head. The referee having no choice but to step in and stop the fight. It is slated that Ritson will take on the winner of the Commonwealth title fight between Tommy Coyle and Sean Dodd, although former British title holder Scott Cardle will want to get back into the action also. Francesco Patera Upsets Lewis Ritson in Newcastle!